Have you ever published a blog post that just flat lined? You put everything you have into your post, publish it, then promote the post as much as possible and wait for the hordes of raving fans to comment. You wait and wait, but still nothing. Then a few comments trickle through but you’re sat there thinking – is my content even being noticed? You’re not the only one who has experienced this, we have all been there. In this post I’ll share why comments are important and how to start getting far more comments than you thought possible. Why should you encourage blog comments? There are a bunch of reasons why blog comments are awesome. Increase social proof – I touched on social proof in my post last week, when a lot of people comment it makes your blog look popular. Gauge how well your posts are received – Feedback is awesome and blog comments are a great way to get post specific feedback. Develop relationships with your audience – Getting ahead on the web is all about developing and maintaining mutually beneficial relationships. Get to know your audience better through your comments. Give your readers a voice and help them become part of the conversation – Your readers want to be heard, give them a voice and watch engagement soar. The benefits are there; leverage social proof, get instant feedback, get closer to your audience, develop relationships and boost engagement. Despite the benefits of blog comments, you need to seriously consider how they will fit into your overall blogging strategy. If you want to take things to the next level, it’s important to remember that every tactic or marketing channel you implement on your blog needs to be part of a cohesive strategy. For example, there are some blog posts where I don’t actively encourage comments because I have different conversion goals (another idea I touched upon last week) such as encouraging email sign ups. Make it easy for your audience to comment (remove elements that cause friction). Removing elements that cause friction with your audience isn’t always easy, sometimes it requires design tweaks that not everyone can do – but if you can, it’s well worth doing if it fits with your overall blogging strategy. 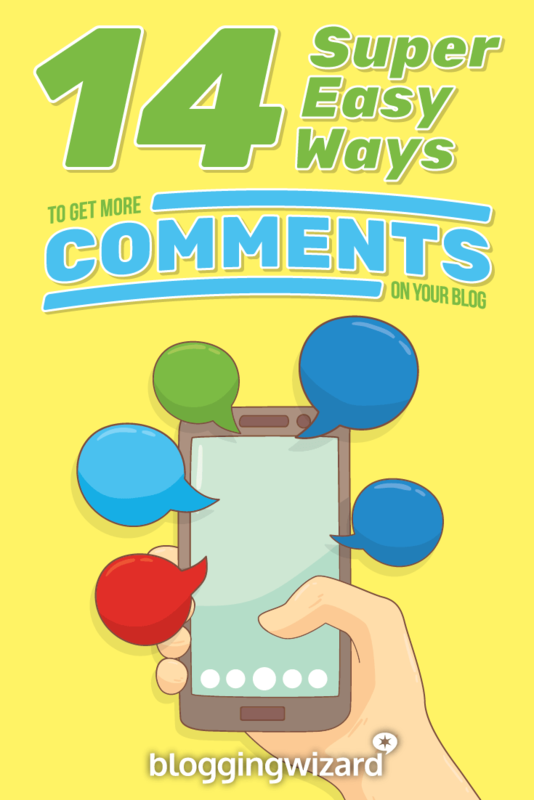 Are you ready to start getting more blog comments? If you are using any type of captcha’s that your readers have to fill in before they can comment – remove them. In most cases this just causes friction with your readers and doesn’t stop spam in the slightest. For spammers, it’s easy to get past captcha’s and there are even services that will solve captcha’s for a small fee (we’re talking just over $1 for 1,000 captcha’s). I used to see comments that required registration a lot more; thankfully I am seeing this less and less. This adds far too much friction and makes it much more hassle than it should be for your visitors to comment. On a similar vein as forced registrations, it’s worth considering how the commenting system you are using impacts your visitors. An example of this would be Disqus; it’s a great system that stops spam in its tracks but it’s another hoop for your readers to jump through (that’s if they aren’t a Disqus user). Email notifications are managed for you. You can earn money from the platform. You probably won’t need any other comment for blocking spam. For those commenting, it’s easy to manage all of your comment replies from one place. But despite these positives, it’s worth considering how using a platform like this could impact how many comments you receive. Plenty of other bloggers have talked about why they are removing Disqus and why they avoid commenting on blogs with Disqus, Gary Korisko shared his thoughts here and the post generated some great comments. I’ve been a Disqus user myself for a long time and some feedback I’ve received showed a dislike for the platform so I’ll most likely remove it when I re-design my blog. My plan is to test how things go without Disqus, and you should too – testing is essential to find what works for you. One of the problems with a lot of blog themes is that you have to scroll all of the way to the bottom of the comments to enter your comment. And because one of the keys to getting more comments is to make it easy for your readers to comment, we need to do something to make this easier. You can do this by linking to your comment form at the end of your post, a good example of this in action is what Noah Kagan does on his blog; OKDork.com. In the screenshot above, Noah links to his comment form twice, when you click on one of these links you will immediately be taken to the comment form. If you’re a WordPress user and you don’t have anything like Disqus installed, you can do this by linking to #commentform. But you’ll only need to add #commentform. I’ve talked about this numerous times in the past and its relevant here too. When someone is given too many options, they will take the easiest option; no action. Look at your blog and consider what you should remove – what is really helping you achieve your goals? I mentioned social proof earlier on and it’s an important one. If you aren’t getting many comments on your blog yet, avoid drawing attention to your comment counts. If you aren’t getting many comments (yet) or you are getting the wrong sort of people commenting on your blog, it’s worth taking a look at who you are really trying to reach. Once you get to understand your audience better and focus on the right areas, your comments will increase. I’m sure you are doing this already, but I’ve included this for completeness. Take a look at your content and ask yourself if you would leave a comment, if not – what’s stopping you? And what can you do to change it? One of the best ways to get your readers to comment is to ask their opinion. Ask an open ended question at the end of your blog post but most importantly ensure that it’s not a question that would result in a yes/no answer. Your aim should always be to develop a discussion within your comments – the more discussion, the more it will get other people talking. Your email list is your new best friend. Your email subscribers are the most likely to share your content and the most likely to comment when you ask them to. Try signing off your email with a call to action that simply asks your subscribers an open ended question or asks them to leave a comment. If you write everything that can be said about a topic, you won’t leave much room for discussion. Admittedly, this is one of the biggest reasons why I don’t get as many comments as I could. I write mostly resource intensive posts which leaves minimal room for discussion. This is worth considering, but you should also consider how this would fit in with your overall blogging strategy. I find that I get more social shares and traffic when I publish more comprehensive posts – I take a hit on the comments in favor of broader visibility. I may change this up in the future to see how it plays out – let me know your thoughts on this in the comments. I’m big on influencer marketing – saying cool stuff about people and linking to their blogs can help you get more shares & traffic, but it can also help you get more comments. When I say cool stuff about people and link out to them in a blog post, I get more comments – more often than not, these are comments from the people I mention and this brings them into the conversation. Engaging your audience is essential to not only getting more comments but also growing your blog in general. One of the best ways to do this is to respond to comments and encourage more conversations – ask questions, get to know your readers and take the conversation further. Chances are that people follow you because they want to hear what you have to say – that’s one of the great things about having your own blog. Your readers want to hear from you. So, let them hear from you. Accepting blog contributors works great; it can expand your audience, increase your traffic and email subscribers too. But, the moment that the majority of your posts are from contributors, is the moment that you start to lose your voice. Your readers want to hear from you – let them and it will help to forge a stronger bond with your audience. People love to feel cared about. And you should care what your audience thinks, they are the reason your blog is where it is now and they’ll be largely responsible for getting your blog to where you want it to be. If you’ve made a change on your blog, find out what your audience thinks – make an announcement and ask for feedback. When your blog’s community grows, you will get more blog comments. One of the best ways to expand your own community is to contribute to other blogs within your niche that already have an active community. This could include contributing guest posts or contributing engaging comments. Writing engaging comments is something that works particularly well, Ryan Biddulph is a great example of someone that does this exceptionally well. You will get more email subscribers, increased traffic, increased visibility and if your new subscribers like what they read – they’ll comment (as long as you make it easy for them). Creating a community around your blog can be challenging but it can be done, and comments are one way to do it. But, the reality is that your community doesn’t just have to exist in the comments section on your blog. You could create your own membership site and add a discussion forum to it. This could be for free members, or your paying customers. Another alternative is to run your own Facebook group. While you’re building a community on ‘rented land’, it has the potential to grow faster thanks to Facebook’s built-in audience.